Congratulations to "Taurus", the winner of Toni's giveaway. Thank you to all who participated. I’m not someone who has wildly exciting dreams. They usually involve being chased by Tyrannosaurus rex, or gorillas, or trying to go through ever increasingly smaller doorways. I’m sure there’s a very interesting psychology behind these dreams but they’ve never sparked an idea for a story (although I suspect Michael Creighton shared the T-rex one as a young man :)). About eighteen months ago I awoke from a nightmare with the sweat pouring off my skin and my heart literally pounding. I’d had an incredibly vivid dream where I was pushing a stroller along this country lane. My daughter (as a toddler) was balancing on fallen logs and running through dead leaves at the side of the lane. Then she disappeared from sight but it’s like she disappeared off the face of the earth because the whole world went silent—even the birds in the trees and the rustle of leaves. The baby is in the stroller and he starts to fuss. And then this man walks out of the trees and holds up my daughter’s coat. The man is wearing a black mask and I can’t see his face. I’m paralyzed. I don’t have time to get the baby out and run and even if I did, I can’t leave my daughter. I wake up just as the man is coming toward me and I’m just standing there like the proverbial deer in headlights. Ugh, I can’t even tell you how awful that dream was. But then I connected the dream to a story idea I’d been playing with, a Romantic Suspense set in a remote community on Vancouver Island, and suddenly I had everything I needed to start the new story. An old mystery intertwining with a new one, and a hot romance :). That story is DANGEROUS WATERS and releases today! Sergeant Holly Rudd arrives in the coastal community of Bamfield after local divers discover a body with a knife jutting from its chest in the waters of Barkley Sound. As she investigates the crime, Holly soon realizes the sleepy town is rife with secrets. But what unsettles her most is the residents’ insistence that she bears a striking resemblance to the victim of a murder from three decades earlier. She shrugs off the uncanny likeness as a coincidence. But her simmering attraction to Finn Carver, one of the divers who discovered the corpse, isn’t so easy to ignore. Finn, a former Special Forces soldier, knows it’s best to keep his distance from Holly. Yet it isn’t long before they both give in to the consuming desire they share. And as the danger escalates, Finn and Holly must rely on each other to thwart the plans of a cold-blooded killer who’s intent on keeping the past buried. So—what do you dream about? 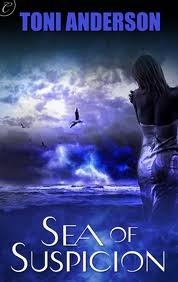 One person leaving will win a digital copy of SEA OF SUSPICION. Order from Amazon USA or UK. Also, Canada, France, and Germany. Also in print from Barnes & Noble (US) and McNally Robinson (Canada). Check out Toni's website and Amazon Author Page for a list of current titles and her blog for more details. I've also started some picture boards for my novels and travels on Pinterest. Giveaway ends 11:59pm EST Nov. 20th. Please supply your email in the post. You may use spaces or full text for security. (ex. jsmith at gmail dot com) If you do not wish to supply your email, or have trouble posting, please email maureen@justromanticsuspense.com with a subject title of JRS GIVEAWAY to be entered in the current giveaway. Happy Release Day, Toni. I usually don't remember my dreams. I do remember some of them having to do with me back in school. I'm jealous of those whose dreams don't invade their sleep. My vivid, epic dreams leave me exhausted. :) I just woke up from one that combined last night's Castle with my website development. It was HTML with guns! LS--I don't remember many dreams either, I think that's why I was so freaked by the nightmare. LOL Cris--thanks :) If I did micro I'd have more nightmares ;) Know people who work with Ebola and Marburgs. Eek!!! Maureen--thanks. I signed up to Mail Chimp. I like it better so far. You rock, BTW. Dreams... I do not tend to remember them much... just once in a while I will remember one when it is extremely dramatic or real like. actual story in the "real world". I just wrote your name on my 'to read' list. Wow... I can't believe the people who don't remember their dreams. I wish I couldn't! I have the general "run from the killer" to end of the world nightmares. One of the worst was an atomic bomb went off and the only survivors were my younger brother and I. I found a cave and scavenged food to take care of us. I had to beat back "melting" people and deformed(limbless)beings. It was terrifying when I realized one was a family member. The scariest was I was asleep with a hallway light on so my young sons could find their way to the bathroom in the night. I woke up and saw a man with a knife standing in my bedroom doorway. Luckily the phone woke me up.... only to realize the man was still standing there. I flew out of bed trying to come up with a plan to save my sons...terrified I might be too late. The phone rang and this time really woke me up. I remember crying for a long time and sitting & watching my sons sleep. I'm so interested in your book! Look forward to reading it! Thanks for stopping in! Jo--wow, they are dramatic dreams! A dream within a dream--terrifying! After the college footfall upset this past weekend, I dreamed of the Rose Bowl Football Game. I left my car parked at the Rose Bowl and came home. In the dream, there was no indication that how I got home. One moment, I was at the Rose Bowl and the next moment I was home with no car. I panicked because I need my car the next day to get to work. No one in the family was giving me a ride to the Rose Bowl to get my car. The next thing was I woke up and all I could think of was I need to go to the Rose Bowl to pick up my car. It took me several seconds to realize, it was all a dream. I know nothing about football!! LOL at the car dream, but it isn't funny when you are in it. 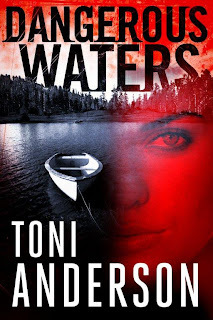 Congratulations on your new release, Toni! Every so often I dream about one or both parents - I believe the dreams are triggered by issues family members are dealing with. Sounds fantastic :) I'm so boring... I usually dream about work. Usually crazy stuff at work that makes no sense at all!!! Thanks for the chance. I tend to dream about the last thing I thought of before falling asleep. So what I read often dictates my dreams. Nothing too scary thank goodness.